The Beginner’s Guide to Insight Meditation – loudlatinlaughing – Euge! Euge! “Another book about meditation?” you groan. Yes, grasshopper. 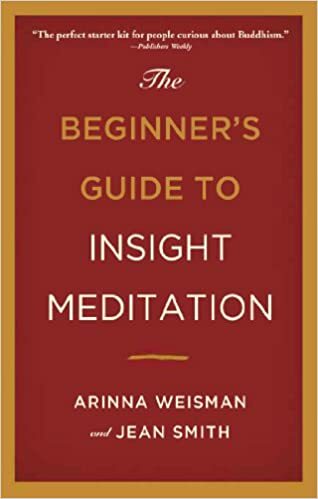 Only this one wasn’t nearly as good as Mindfulness in Plain English—clunkier, interspersed with tedious personal reflections by each of the authors, and much more concerned that I learn the 5 Hindrances, the 4 Noble Truths, the Eightfold Path. Too structured! The one tip I picked up was around turning your regular walking into a meditative practice by counting the steps. When you take the first step, that’s 1. On the next 2 steps, 1, 2. Next 3 steps are 1, 2, 3. Etc up to 10. Upon reaching 10, it’s 10 for the first step, 10, 9 for steps 1 & 2, etc. Otherwise, there’s an extensive list of books for further reading that I’ll probably hit up. But this one is a waste of time and energy. It’s ok, I’m observing that negative thought from outside myself and watching my reaction. Om.